Summer mountains are a new and highly marketable type of leisure activity. In summer, mountain resorts offer a lot of opportunity for active and healthy recreation. Summer vacation in the mountains can become a real adventure. Visiting our presentation , you will get an opportunity to learn more about the unique possibilities of summer leisure in the mountains first-hand – from the representatives of the mountain regions. 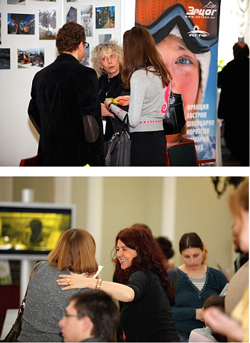 2010- Forum “Going to the Alps in Summer”, Chamber of Trade and Commerce of Russian Federation. 2011- Forum “Going to the Alps in Summer”, “Bitsa” Equestrian Sports Center. The event featured eight companies. The project was also joined by Russian Mountaineering Federation. 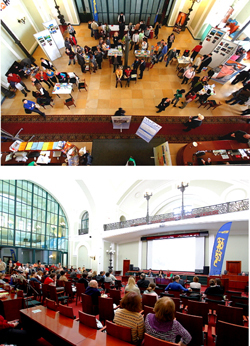 2012 – Forum “Going to the Mountains in Summer" The team of Moscow Ski&Board Salon has for 19 years been organizing the most important events in the area of skiing and mountain resorts construction industry. Such events as Moscow Ski&Board Salon in Gostiny Dvor, the forum Ski Build Expo, and Salon Expo E_Journal have long since been recognized as the main venues for the meetings and dialogue between the professional visitors and their clients, skiers, and snowboarders, advocates of active lifestyle in general, as well as the suppliers of the tourist product – not to forget the demonstration of the latest achievements in the area mountain resorts construction and maintenance. “Going to the Mountains in Summer” will for the third time around present the Alps' tourist potential via the two major regions - Chamonix and Valle d'Aosta. Organizing this workshop, the team of Moscow Ski&Board Salon stresses the all-season character of leisure in the mountains. The already-popular mountain sports, such as snowboard and skis, are added to by the summer sports – rock climbing, mountain biking, kiting, rafting, and others. The organizers of the workshop view the potential of mountain resorts not only in the context of skiing industry but also from the standpoint of any active leisure activity combined with sports. This trend is becoming more and more apparent. The purpose of this event is to demonstrate to the Russian tourists that mountain resorts offer not only the winter skiing vacations but also the summer types of leisure, already popular in Europe. “Summer in the Alps” is the synonym for active leisure. In Valle d’Aosta, you can go in for various kinds of sports: trekking, mountaineering, rafting, riding on horseback, mountain golf, mountain bike. As a matter of fact, for four centuries already, the European tourists have been visiting the mountains in summer. Russians are beginning to appreciate that the snow-covered slopes cover something that’s even more beautiful – explains Anna Saudin, the prepresentative of Ministry of Tourism of VALLE D’AOSTA. Working space and working meetings The hall of Chamber of Trade and Commerce of Russian Federation The hall is capable of housing the worktable and the drink reception area. The 200-people conference hall is equipped with all the necessary presentation equipment. The officially accredited professional visitors will get lottery gifts from the organizers! parafilo@mail.ru subject: “Going to the Mountains in Summer. Press”.